We're only a few days out from the Patriots Super Bowl loss and already people on the Internet have begun Bradying, posing in the seated, dejected stance that Tom Brady assumed during his agonizing loss to the Giants. Bradying follows in the footsteps of Tebowing, which followed in the footsteps of stocking, which followed in the footsteps of planking. Basically, if there is a "-ing" word out there, it has been co-opted and turned into a tired Internet meme. 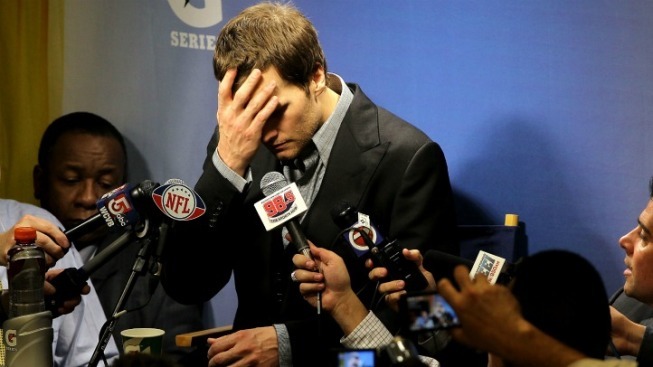 People of Earth, I beseech you to not get caught up in Bradying. Chances are, it's already being done by people who aren't cool enough to know how to use the Internet properly, people like your mom, and LeBron James, and every single member of Congress, and the Kardashians. You don't want to lump yourself in with that crowd. They're weak. Frankly, the fact that I'm addressing this issue now makes me also behind the times and lame. The problem with Bradying, apart from it being stupid, is the fact that it's really just a different version of planking. Planking was the original "-ing" thing on the Internet. Every subsequent meme has just been an unimaginative reworking of the same idea. For a truly NEW meme, you have to wait until someone at 4chan decides to slap a .gif of a baby doing a crotch chop at the end of various news clips. Now THAT will be something new and cool and interesting for three seconds before it's awful. That's how the Internet works. Trends get worn out before they even have a chance to take root. And if you aren't acutely aware of what's funny NOW and what is no longer funny, then you will not be greeted with LULZ in your chatroom. So avoid the Bradying, people. Just be like me and enjoy the Pats loss by sitting in your TV room and guffawing out loud for a full week.